Why worry? There are only two things to worry about: either you are well or you are sick. If you are well, then there is nothing to worry about: but if you are sick; there are two things for you to worry about: either you get well or you will die. If you get well, then there is nothing to worry about. If you die: then there are two things to worry about: either you go up or down. If you go up, then there is nothing to worry about. But if you go down you will be so busy shaking hands with old friends you won’t have time to worry. This polished Connemara marble worry stone is a classic oval design that measures 1 3/8" x 2" and according to Irish lore, “Rub this stone and let your worries disappear." 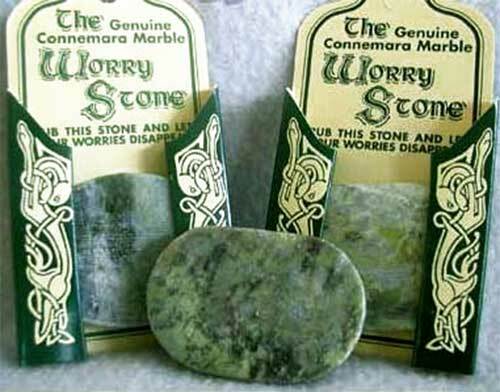 The Irish worry stone is mined and crafted in Ireland by J.C. Walsh and Sons and it is complete with a Connemara marble history card that is complements of The Irish Gift House. These genuine Connemara marble wishing stones are from the Galway Mountains of Ireland.